Have you been struggling with sleep? This episode discusses its importance, some factors that make up good sleep, and things that can be done to improve the quality of your sleeping hours. 02:59 – Do you know if you’re sleep deprived? 10:02 – What is the circadian rhythm? 15:48 – Is caffeine good or bad? 29:10 – Have you tried sleep restriction? James: James Schramko here, welcome back to SuperFastBusiness.com. 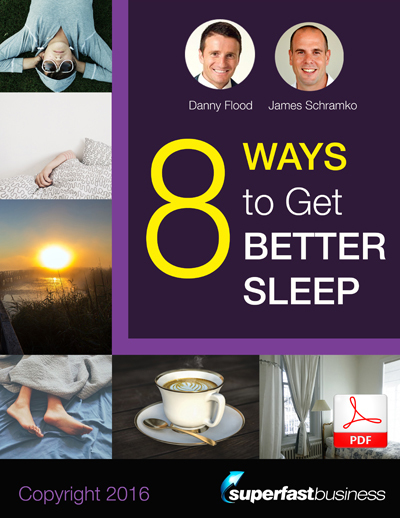 Today, we’re delving into the topic of sleep, how to improve your sleep, with Danny Flood from OpenWorldMag.com. Welcome, Danny. Danny: Hey James, thanks so much for having me here. It’s always a pleasure to speak with you. James: Well, it’s nice to pin you down. 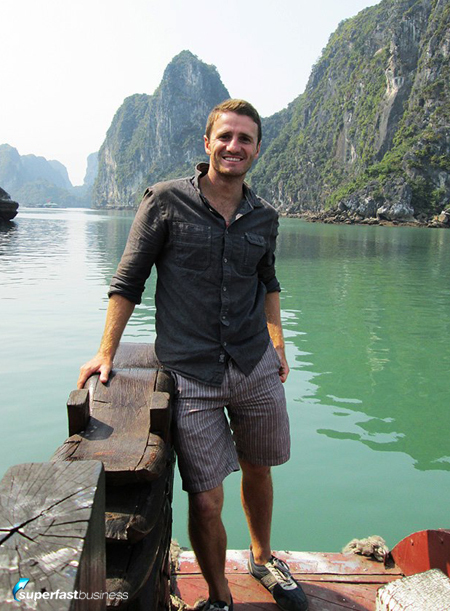 I know you’re on travel at the moment, and you’re somewhere in the outposts of Thailand, so I’m also glad that you could join us and share some of your insights into how to improve your sleep. You’ve actually got a product on Amazon called Hack Sleep. I know you’ve done some research around this, you’ve got a body of work that presents your findings, and I know that most of my audience sleep, so it’s something we should learn about. Why did you even go down this route of sleep as something you were interested in? Why the interest in sleep? Danny: Yeah, sure. So I’m calling today from Thailand, I’ve been travelling. You might hear roosters behind me in the background from this hotel room. I really was interested in sleep because this was something that I struggled with for so long. I’ve been a personal improvement junkie for more than a decade, reading a lot of self-improvement books. I could stay at the bookstore for five hours and it would just pass by like five minutes. I’m really big on performance, especially mental performance. But one thing that I never really figured out was sleep. It was something that I struggled with. I was always an insomniac. Sleep deprivation tormented me, and I had so many wasted days because I didn’t sleep well at night, and it would snowball because it would be like a psychological effect where I’d get really upset that I wasn’t asleep, I’d get depressed and had a lack of motivation where I wasn’t… I had goals but it was subverting my goals, so I wasn’t giving my best effort to them. I published my first book last year, it was called Buy Your Own Island, and I wrote four books after that, and the last one I wrote was Hack Sleep, and the reason why I wrote that book was, I knew this author, and I asked him, “What kind of books do you write?” And he said, “I write books that I really am interested in and I enjoy,” and this was the topic that I was really keen to figure out. So I spent about nine months learning up and trying everything that I could. Sleep is such a complex process on so many levels. And so I spent about nine months to a year just like testing all this stuff on myself and recording the results and kind of put it together into this cookbook which I call Hack Sleep, which are kind of like easy cures that you can use to, when put together, they make a powerful result. Do people know they lack sleep? James: Do you think some people are not aware that they’re getting less sleep than they should? Danny: I think most people are pretty aware because it manifests itself in your daily life. When you get poorer quality sleep, it affects all of your life. You can’t go out, you can’t go see your friends because you’re too tired. You can’t give your best performance at work. You have to cancel commitments. It’s just because you don’t have enough energy to do all this stuff. Like Bill Gates for example, like people ask him, “What superpower do you wish you have?” And he says, “I wish I had more energy.” And that’s really the thing, is a lot of people, it’s kind of like, if you don’t sleep well at night, you don’t have enough energy to go through the day, you’re not doing enough during the day, then you don’t sleep well at night. So it’s kind of like a slippery slope there, I think. James: Well, I have no doubt that it’s the cause of a lot of people’s issue, but I just wonder if they actually recognize that as the issue. When they’re waking up tired, do they realize that they’re not sleeping like they would have slept before electricity was invented or that other cultures sleep twice a day? And as they dive for their caffeine and sugary drinks to try and get, inverted commas, energy, or even worse, energy drinks, I wonder if they realize the cycle they’re stuck in. Because some of the research I’ve done indicates that most adults don’t even know what a good night’s sleep is since they were a kid, since they were a little kid riding around their BMX bike, coming home at dark, having dinner and then going to bed. A lot of them never actually have a good night’s sleep since that time in their life. And maybe they just forgot what it’s like. Danny: Yeah, I think a lot of people do. You know, one thing that I like to say is a lot of people get addicted to their struggle. We become so caught up in the daily grind and punching in a timecard that we just don’t really have a chance to step back, we’re not mindful enough to be able to make meaningful changes in our life. And you actually mentioned a great hint there when you mentioned electronic lighting. And I think electronic lighting has perhaps one of the most destructive inventions to our sleeping habits that has ever been introduced to humankind. We typically, on average, we spend one hour less sleeping than we did a hundred years ago. And the culprit is electronic lighting. And there’s actually studies that show that electronic lighting contributes to obesity, it also contributes to cancer in mice. It contributes to all of these ailments, and the reason why is because it fools your brain’s internal clock. It throws off your circadian rhythm. Your typical circadian rhythm is… one day lasts 24 hours, but a circadian rhythm tends to last 24 and a half hours to 26 and a half hours. So we need to adjust our internal clocks constantly, and the way that it does that is light passes through the eye’s retina, and it’s relayed to the hypothalamus. So during the daytime, it’s really important to get as much light exposure as we can. Around noon is when you can get the most light exposure, you can get the most by far. So a 15-minute walk around lunchtime can really work wonders. And block off all light at night time because it’s actually very harmful, and it blocks melatonin production, and you get poorer quality sleep at night. James: Yeah. So one thing that I read a long time ago and I’ve adhered to is when I’m travelling at a new destination, in the morning, I make sure I don’t wear sunglasses when I’m at a new destination. I’m letting the light come into my eyes to reset my body clock. Is that fact or myth? Danny: It’s absolutely true. And getting light exposure during the day is one of the biggest productivity hacks that you can do. Like as soon as you wake up, you want to get as much light exposure from the moment you wake up to start your body clock, and what it does is, when that light hits your brain, it’s released as serotonin. So serotonin improves your mood, it reverses depression, it makes you feel more energized for you to take on your day, and more productive. If you’re in a dark environment, when you work, you’re always going to be less productive because your mind just thinks, it’s dark now, it’s time to rest. If it’s not sunny where you are, if it’s winter, a lot of people use light boxes, and it’s very effective. People report that it can actually replace coffee in terms of how much energy it gives you. It can really improve your mood, as I mentioned before, and it has a lot of benefits. James: Wow. You know, one thing I noticed when I moved location for where I live, I used to be what I would consider a night person, a night owl. I’d work through till two or three in the morning and sleep in till 10. When I came to this new place, I’m at the beach and it’s northeast facing. In the morning, the sun comes up over the horizon. I wake up with the sun. It just turns on the natural light, my body just wants to wake up. And at the same time. I feel tired earlier at night, too, as I’m spending more time away from devices. So I think that’s a good indication that working with the natural sunlight if you can, if you’re close enough to the equator, I suppose, instead of at the poles, then it’s a good natural way that you can use light to trigger your melatonin release and be more alert. So I guess we’re moving into the what you can do about improving your sleep. So let’s just catch up to where we’re at. Right now, we’ve figured out that sleep is very important, for all the reasons that are probably super obvious, that it replenishes you, refreshes you, you’re repairing your mind and your muscles and it’s your off time, and it’s vital for us to have this. We do have a choice, and we can change if we want. So Danny, what are the things we can do to change the sleep that we’re getting? Danny: Yeah, so the first thing you need to understand is that sleep is a very complex process. It depends on five different types of factors. And these are social, neurological, psychological, cellular and molecular. And so all five of these areas must be synchronized correctly in order for you to fall asleep. So if one area is disrupted, it throws everything off. For example, we mentioned psychological. So if you have too much stress going on in your life, if you’re not dealing with cortisol, if you’re not reducing cortisol levels effectively, you’re not going to sleep well. Even if you’re getting enough light, even if all the other hormones are firing off properly. So we can kind of just go through those and have some really simple hacks and cures. I guess the first thing to start out with that you need to understand is, when I was writing this book, I was really influenced by the book, The Power of Full Engagement by Tony Schwartz. And interestingly enough, he’s actually the co-author of The Art of the Deal, with Donald Trump. Same author, and he’s got a company called The Energy Project. And he’s really big on managing energy and not time, and he really introduced me to ultradian rhythms, which are 90-minute periods of activity, dipping energy levels, and rising energy levels. And so the same ultradian rhythm applies to sleep. But what I found really more interesting was the circadian rhythm. And the circadian rhythm, as we mentioned, is kind of like your body clock. So it’s more like a 24-hour clock, and your energy level is always rising and falling throughout the day and the night. And it really corresponds to light entering the eye. If you want to reduce jet lag, for example, you reset your clock and you get lots of light, and what’s also really interesting is that circadian rhythm correlates to your levels of alertness, your levels of energy. So how much you’re able to perform during the day. It also corresponds to light and body temperatures. So you have your highest level of alertness mid morning, and then it dips to its lowest point at 3 p.m. So that’s when I usually like to take a nap, around mid afternoon, 3 p.m. And then it rises again after 5 p.m. 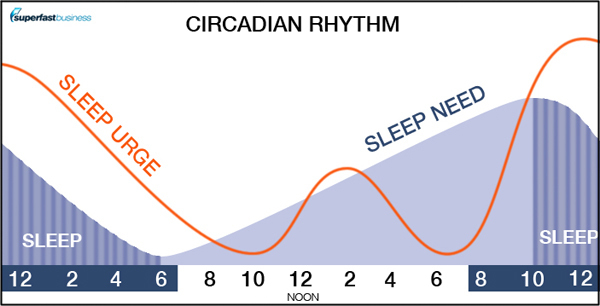 This is your circadian rhythm. And then again, your body temperature reaches its lowest point at night time, around 2 or 3 a.m. So I always try to structure my activities and what I do during the daytime to correlate to the circadian rhythm. And it’s very important to understand. That’s kind of the introduction. Shall I keep going here, James, or did you have a question? James: Well, I just want to say a few things there. Firstly, it was fascinating watching Schwartz say that he was very unhappy about having to write The Art of the Deal. There was quite a lot of controversy about it, let’s say that. Regarding the mid-morning thing, that makes a lot of sense with the advice we get to do our most important tasks early. I love the energy management idea. I loved The Power of Full Engagement. I also like the book called Willpower: Rediscovering Our Greatest Strength, which suggested we get this amount of willpower like a bank account balance that gets used up during the day and gets depleted by night. And it’s funny how you said afternoon sleep because that’s exactly when I like to have my little after-lunch siesta. And also about the body temperature dropping, I used to remember about three in the morning, my body would start shaking from fatigue, and I’d get very cold. So it’s interesting to me that you’re saying that our body temperature drops at that time. Also the outside temperature drops, and it’s probably a very good time to be fast asleep rather than trying to be doing any kind of work. Anyone who has a domain name portfolio that they purchased after midnight will probably attest to that, bad decisions being made at that time. Danny: Yeah. You can fight against this circadian rhythm, but you do so at your own peril. Because this is the way that your brain naturally wants to operate, and if you try to power through that 3 p.m. period, yeah, you can, you can spike your energy level by drinking more caffeine, but you’re not going to be able to perform as well if you’re following the natural cycle of rest and activity, basically. So Tony Schwartz says the rest-activity cycle, he also says a quote that I love, “Humans are not machines, and we’re not meant to perform continuously for eight hours straight.” The better you understand this, the better off you’ll be, and there’s actually a graphic, if you like a visual, if you just Google “circadian rhythm for alertness”, you can see the peaks and the troughs in your circadian rhythm. I really try to optimize my day to match the upswings in my circadian cycle. James: We’ll get that image and we’ll put it in the show notes here. OK, so we’ve talked about psychological and cortisol. Let’s talk about some of the other factors as well. Danny: OK, sure. So one that kind of compliments what we’re talking about here really well is, there’s this hormone called adenosine, and interestingly enough, when we first learned about adenosine, I think it was about, oh, I don’t know the exact date, but it was about seventy or eighty years ago, and there was a scientist called Piron. And what he did is, he hypothesized that there was a sort of sleep toxin that built up during the daytime, during periods of wakefulness that contributed to putting us asleep at night. And so what he did was, he would purposely sleep-deprive these dogs. He would keep them awake for days, and he would insert a needle into their spine and eject spinal fluid. And he would take that same fluid and inject it into healthy dogs. And what he found was, he discovered this sleep toxin where the healthy dogs suddenly, they passed out because they had this foreign substance injected into them. And we really didn’t know at the time what caused that. Now, we do know that it actually is adenosine. So caffeine, for example. You know, caffeine works to block adenosine. That’s exactly how it works. It reduces fatigue by blocking adenosine accumulation in the brain. And what you need to know about adenosine is that it accumulates when we’re awake, and it replenishes when we’re asleep. And what it does, it’s kind of like the fatigue hormone that breaks down adenosine triphosphate which provides life for the cells. It’s really interesting. One of the best ways to sleep better at night is to force yourself to do more hard work during the day because adenosine build-up in the brain and body corresponds to the activity level of your body’s neurons. So if you’re operating at high performance mentally, if you’re operating at high level mentally, or doing physical exercise, that consumes adenosine triphosphate faster, you build up more adenosine. So the more hard work you do during the day, the better you’ll sleep at night because you have more adenosine accumulated. James: Well, that makes sense, because ever since I took up surfing, I’m smiling when I say that because some of my friends now, they say when I say the word “surfing,” they’re going to scull a drink, a shot, because I say it so often. But it’s true that when I took up that sport, I felt tired at the end of the day. Physically tired, and you combine that with a few calls and coaching sessions, then I’m mentally tired, and I sleep really well. I’m ready to go to bed early because I feel like I’m done. And what is your take on caffeine then, if it blocks this? Does that mean it’s bad for us, or does it mean it could have its purpose if we have things to do? Danny: Yeah, sure. Are we talking about coffee, or just caffeine in general? James: OK, let’s say caffeine in general. Danny: OK. So caffeine has a long shelf life. It’s important to understand that. It can provide you a boost in energy, it can block adenosine buildups. I’m a big fan of it. If I need to get something important done, such as this call. I had a coffee about an hour before this call. But if you’re going to do it, it has a long shelf life. So it’s important to drink your caffeine as early as possible. So if you’re drinking coffee at 4 p.m., about 50 percent, I don’t know the exact number, I have it somewhere in my book. Here you go, if you drink coffee at 4 p.m., 50 percent of that caffeine is still in your bloodstream by 10 p.m. So it can take more than 12 hours for the caffeine that you consume to completely exit your bloodstream. That will contribute to poorer quality sleep at night. I really try to get that first coffee, the only coffee, as early as possible, as soon as I wake up. James: Right. It’s good to know also, if you’re having coffee very late, and you can’t sleep, that’s probably it. And some people metabolize it at different rates too, I found out when I was doing my DNA research. It turns out I’m a fast coffee metabolizer. But if someone were to be a slow coffee metabolizer, and they have strong coffee, and they have it late, they’re probably even more at risk. Danny: Yeah. It’s a really funny thing you know. I think caffeine affects some people differently. When I was in Malaysia, my friend, he drinks coffee at night because it has the opposite effect on him. It actually makes him feel more tired. James: If I have too much coffee, I’ll just want to sleep. I can actually have a coffee and go straight to bed and sleep just fine. It’s the weirdest thing. People think that’s odd. Danny: Do you find that it affects your mood or your psychology at all, James? James: Definitely. If I have too much coffee, then I will probably start to get short on temper, and I will be more passionate about decisions. So it could make me more cranky, but it can also make me kind of hypersensitive and super alert as well. So I enjoy having a nice coffee shot before I go for a surf – there you go, have a scull – because I just feel like I’m really in it. It’s the strangest thing. But I wouldn’t say I’m over-reliant on it, and I think I built my tolerance to it fairly well over the last years. I enjoy coffee first thing in the morning, and I also enjoy an after-lunch coffee before I go to sleep. As I was saying before, it’s a strange thing. And it doesn’t bother me if I go out to dinner with friends or whatever, I can easily have a coffee at night time and still go home and sleep like a brick. Danny: Yeah. So I think the important thing to understand here is to be mindful of how caffeine affects you, how it affects your mentality, how it affects your psychology. So if you’re drinking coffee, and you feel good about it, that’s fine. Keep drinking coffee. But if you’re drinking caffeine, and it’s taking it’s toll on you, if it’s making you more stressed, if it’s disrupting your life, disrupting your circadian rhythm, then it’s important to take a step back. What you have to understand is, you know, obviously, we humans are irrational creatures. If we need more energy, we’re going to do anything we can to get it. But there’s really other ways to get more energy and to get into state other than caffeine that you can substitute for a coffee for example. James: We should talk about that because I am expecting you are going to advise against eating a packet of crisps or chips, or going for sugary lollies, etc. Danny: [Laughs] Yeah. So I’m living in Thailand here, and there is so much junk food here. Everything has sugar in it. So it’s really a challenge for me. What I try to do is I just try to practice a process of substitution. So for example, I start craving sugar, and what I used to do, I‘d gotten this habit where I was drinking Thai Tea, which is packed full of milk and sugar, and I’d always feel tired after I drank it. So whenever I have that craving, I just substitute that craving and make it more healthy. Substitute for something more healthy, like instead of drinking Thai tea, I’ll drink a coconut for example. So when you have that craving, if you have a craving for something unhealthy, like coffee for example, you can substitute something else for that. So if I want more energy, if I want to get into state, there are other ways to get more energy rather than drinking coffee. For example, I did this call quite early for me here in Thailand, and before, I was listening, so I was listening to music, I was doing a little bit of dancing, trying to work myself up, trying to get my physiology going. That’s another way that you can substitute for coffee. Amy Cuddy, she has a great TED talk, I highly recommend everybody watch this; one thing she says that’s really stuck with me is that leaders have high testosterone and low cortisol levels. So anything you can do in your daily activities that can boost your testosterone, whether it’s physical exercise, just movement, our bodies were built to move, and anything you can do to lower cortisol levels. I have a bunch of stuff I can give you about cortisol. But going back to psychological factors that can disrupt our sleep, cortisol is the stress hormone that is the primary culprit. James: Right. This would be Amy Cuddy’s Your Body Language Shapes Who You Are? Danny: Ah yes, exactly. She actually talks about a lot of stuff in that talk such as power posing and stuff like that. Danny: But then there’s also some other great points that she addresses. James: So we talked about cortisol a fair bit and adenosine. Is that right? James: And coffee. What else do we need to know if we’re going to get better sleep? Danny: So going back to cortisol, cortisol is essentially the stress hormone, and it tends to get a bad rep. If you google cortisol, everything you’re going to see, every article is going to be “How to reduce cortisol.” But it actually does have some good effects. For example, in 1936, the term “eustress” was coined, and it’s a sort of good stress, which helps us to overcome challenges such as getting out of bed in the morning, or climbing a mountain, something like this, that kind of pressure. The problem occurs when we continue producing cortisol over an extended period, and we don’t allow these levels to drop. So if we’re continually stressed out throughout the day, it taxes our mind, and we end up burning out, we end up flaming out, and it also blocks our production of insulin, leading to hormonal imbalance. And so, a lot of us live in a fast-moving culture where we keep our stress levels high resulting in cortisol in our bloodstream at all hours of the day and night. That results in some serious issues affecting our ability to sleep. So what I tend to do is, it’s really important to do daily activities that can help you reduce your cortisol when you need to rest. There’s so many ways you can do that. I mean, you can listen to music, you can keep a gratitude journal, you can do dancing, yoga, meditation, breathing, spending time with friends; anything that contributes to relaxation. Magnesium has also been shown to reduce cortisol levels. If you want to do some supplementation as well, so you can easily acquire magnesium tablets at any GNC. But I think that supplementation should only be used in emergency cases. If you’re just writing a gratitude journal, if you’re counting your blessings every day, then that’s enough to reduce your cortisol levels. If you can just have enough mindfulness that you can be able to naturally cultivate levels of joy, and being able to step back and realizing when you’re stressed out, when you’re anything less than joyful, that’s really what it’s all about, I think. James: Right. So basically, I think like you said, if you’re not happy, or you’re stressed out, then it’s going to be a major problem. So it’s about working on a really cause level of how do you improve the quality of your life. It sort of falls back into many of the other topics we talk about on SuperFastBusiness, like setting up a subscription business, designing your life, so that you’re only doing activities that make you excited, and then all these other things happen. I mean, I was out there this morning in the ocean, with dolphins, with the sun, and clear water, thinking how good is this? I love my life. That’s what I do to wake up, is I go and have that swim, the nice fresh air, clean water, feeling good. Like the day is set up nicely, and then I’m only going to do good activities, like talk to my friend Danny about how to get better sleep, and then a couple of other calls, and have a nice lunch, and an afternoon nap; and the day is going to be a great day. So as we just see where we’ve come on this journey so far, we’ve covered this idea that most adults probably aren’t sleeping well. They can choose to have a difference. When you travel, avoid the sunglasses so that you can reset to the light. You’ve talked about the circadian rhythm and when the peak times of days are to be awake, when to sleep. We’ve talked about the impact of things like cortisol and caffeine, and sleep toxin building up in our body. We’ve talked about Schwartz and energy management. What would be your action tips for someone listening to this podcast so that they can make a positive change or to swap something from now so that they might get a better sleep tonight? Danny: Yeah, you kind of hit the nail on the head a second ago where you mentioned how you were feeling when you were surfing. Just full of joy, full of gratitude, and full of life. That’s so important. Maybe you don’t live near a coast, or maybe you’re not a surfer, but just the other day, I was sitting, having a coffee at nine in the morning, opening up my laptop. Just in a state like that, I just feel so grateful that I’m able to wake up whenever I want, that I can just sit here and relax, enjoy a morning coffee, I don’t have to commute anywhere. There’s always things that you can find to be thankful for. I like to just tell people, I tell people that I appreciate my life, that I’m grateful for you. That’s very simple. I’m grateful for you. You enriched my life in this way. The more I’m grateful for, the more I have to be grateful for. So I think that’s really important. But I have a laundry list of other things you could do as well. A lot of the stuff that we already covered as far as caffeine, as far as adenosine, light exposure, cortisol; another important factor is melatonin. Melatonin, you’ve probably heard of before, there’s a lot of supplements out there, which can help you boost your melatonin. I don’t recommend supplements at all. First of all, most melatonin supplements are made from, the active ingredient is actually cow urine, interesting enough. So I don’t recommend using those. So what I like to suggest is, what I actually do is I eat pineapple. Pineapple has been shown to increase melatonin levels by 266 percent. James: Wow. I’m thinking another fun fact about pineapple, it’s what a lot of the ocean-going yacht racers eat on the trip because it’s one of the few foods that taste the same going in as it does coming back out. Danny: Pineapple is amazing man. Yeah. So I try to eat pineapple every day around 5 p.m. or 6 p.m., whenever the sun goes down. 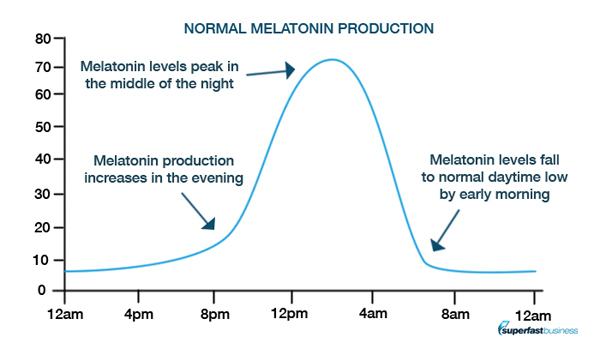 What you need to know is that melatonin production in the brain usually starts around 9 p.m. In addition to adenosine, everything else, it helps us to fall asleep at the appropriate hour. And so, pineapple, bananas also increase melatonin production, studies have found, but not as much as pineapple. If I eat two servings of pineapple, I’ll just sleep like a log. I have trouble waking up in the morning. That’s really helped me a lot because I have a problem with waking up at night. So when we sleep, like I mentioned, we have 90-minute cycles. So we’ll go into a deep sleep, and then it’ll come back up again. So we’re almost awake, and I find that I tend to wake up and then I can’t go back to sleep again. So what pineapple does, it helps me stay asleep at night. That kind of leads me into the next tip. Understand that sleep on a very fundamental level, it just involves brain waves. So there’s four brain waves that we toggle through. Beta, alpha, theta and delta. Beta is when we are wide awake, alpha is when we go through like a meditation, theta is when we go through a light sleep, and then delta is the deep sleep, when we’re very close to being in a comma. So when we do an ultradian rhythm, we’re basically toggling through these different brainwave states. What science has shown us is that meditation can actually help us move from a beta state, a really short frequency wave, to an alpha state, and then back down again. So if you want to naturally move from a relaxed state, an alpha state where you’re ready to fall asleep, you can try meditation. I like to do breathing exercises. So if I’m having trouble falling asleep at night, I will start breathing three or four seconds in, three or four seconds out, slowing my breathing down, trying to meditate, corral my thoughts a little bit. And if I can’t fall asleep within 30 minutes, then I know that I need to get out of bed. I’ll go do some activity for a while, maybe go for a walk for 20 minutes, and then I’ll try to fall asleep again. James: Good tip. So getting a bit of fresh air and resetting. Danny: Yeah, exactly. I have a 30-minute get-up rule. Actually, one of the most powerful sleep therapies is called sleep restriction. I actually do sleep restriction on myself, where you basically force yourself to stay awake longer. If someone’s suffering from insomnia, and they’re going to bed at say 11 p.m., they’re waking up at 7 a.m. but they’re not getting sleep efficiency, what someone like myself might suggest is, OK, for tomorrow night, I want you to fall asleep at 1 a.m., and then you have to get up at like 5 a.m. That might be a little bit brutal, but basically, what you do is you reduce the amount of time they can spend in bed as much as possible. And then the next day, you give them like an extra half an hour. And then you gently give them an extra half an hour each day. I find it to be very effective for me personally. I’ll purposely sort of restrict my sleep a little bit to six hours a night. If I’m doing a polyphasic schedule, so I did polyphasic sleep where I did two or three naps during the daytime and only slept maybe four, four and a half hours a night. But the important thing that you need to understand is that sleep cycles last 90 minutes. So you’re either sleeping three hours, four and a half hours, six hours, or seven and a half hours or nine hours. So it’s an hour and half chunks. And so, for me, if I hit six hours, which is basically four sleep cycles, that’s a good target for me. I can go about my day, and I’ll try to shoot for like a 25 or 30 minute nap around 3 p.m.
James: Right. Cool. So the old polyphasic sleep. Not many people have managed to get that one working properly, have they? Danny: No. And I think there’s a lot of misconceptions about it. There’s so many theories out there, but what it really is, is more than double the people who do polyphasic sleep, they do it because they’re sleep deprived, not because they’re trying to get extra hours of their day, or be more productive, or hack their brain, or anything like this. It’s actually a natural cure for people who are not getting enough sleep at night to take timed naps at regular intervals throughout the day. There was actually a period, about four months last year, where I was just sleeping about four hours a night because I was insanely busy. I would sleep around 11 a.m. and 3 p.m. Occasionally, I might sleep 3 p.m. and 7 p.m. What I found was that I could keep my energy levels high throughout the day even on four hours of sleep a night. James: Wow. Yeah. If you can get it right, it definitely works. It’s just that a lot of people, life gets in the way, doesn’t it? Danny: Yeah, it does. I misspoke there. It was actually four and a half hours. I just mentioned 90-minute cycles, so it’s four and a half hours a night. But yeah, life really does get in the way. I was really busy at that time. I just exited a relationship, so I was single again, and I was going out all the time. To be able to go out in Bangkok, you need to take that little siesta before you go out; otherwise, you just can’t function the next day. James: Because it’s a late night place, right? Danny: Yeah, it is, definitely. It’s a great place to be if you’re a single guy, I’ll just say that. James: Cool. Alright Danny. So we’ve been speaking with Danny Flood from OpenWorldMag.com. We’ll also link to your book, which you can get from Amazon as a kindle. We’ve also got some great charts about circadian rhythm and a TED talk embedded in the post. So head over to the episode called How to Improve Your Sleep. Danny, thank you for sharing this stuff with us. Danny: James, it’s always a pleasure to speak with you. I’m so grateful for you. And thank you so much for having me on your show. It’s a pleasure. Great to be on your podcast James! Always a pleasure!